Tuesdays are for slicing about life. Join us at Two Writing Teachers! Clare's message in the family group text flashed in the middle of a meeting. Given my role as recorder, I couldn't spend time opening the link right then, and the intensity of the conversation in front of me did not lend itself for me to say that devastation was happening in Paris. "Pay attention," I had to tell myself. But when there was a lull in the meeting, I clicked on the link. Images of the flames and billowing smoke overwhelmed me. 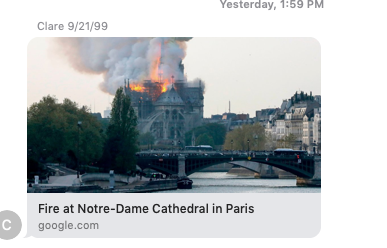 Maybe because a 30th Reunion is looming, maybe because my daughters are in the middle of college, maybe because of other reasons... in any case, I've been feeling nostalgic, and today's fire at Notre Dame added to it. Almost thirty years ago, one of my best friends, Kara, and I boarded a plane for Paris with a pair of backpacks, a Euro-rail pass, a super tight budget, and a list of places to see. We landed at Charles de Gaulle and Notre Dame was one of our first stops on our DIY tour. Together, we explored, admiring the stone carvings, the stained glass, the pillars. We climbed up to the bell towers, taking goofy pictures of us posing with gargoyles. I don't know if we paid attention to the history, read the stories, appreciated the details of the chapel. Maybe we did. Tonight I revisited Notre Dame through virtual tours, as well as through the memories and reflections of my friends on social media. The intricacy, the spirituality, the grandness of the chapel and all its history flooded back, reminding me of our visit so long ago. I wish I had made it back before today. I'm having dinner with Kara at the end of the month--I'd reached out to her before today and we set that up on our calendars. We don't see or talk to each other often, but always assume that our friendship is there, solid as the landmarks we visited when we were 21. Over the last few weeks other events have reminded me of the impermanence of life and the importance of seizing moments, reaching out, doing those things I've been meaning to, but just haven't gotten around to... I have to keep working on that. "Hour of truth," Clare said. P. was hardly out of the car, and I watched him walk across the parking lot and toward his fraternity. Should I say that the first thing I noticed was his pants that were a little tight and short? Honestly, who really cares? It's just that most of the boys who've been around our house wear their pants on the baggy side. Maybe the snugness was just from a recent beer binge, although he was pretty slim... I decided to keep that whole line of thinking to myself. "I like him," I said. He was friendly and polite at dinner, appreciative and happy to answer questions. I liked hearing about how they spent the afternoon playing Jenga at a local coffee shop, enjoying one of the first spring days. I have a sense as to college and what having a boyfriend also involves; I'm trying to repress my own college sophomore days insofar as men, relationships, and freedom is concerned as I think about my almost twenty year-old daughter. "I like how comfortable the two of you are," I said. The two of them had jokes they shared. When I asked Clare what her plans were for Easter, P, was quick to say she was invited to his grandmother's. Judging from her reaction, Clare already knew his grandmother. Since he lives closer to their college, she's already met and spent time with his family a few times. Maybe more than a few times. "And he puts up with you." While he didn't hold the car doors or stay standing until she sat down as her last boyfriend did, his manners were fine. Clare gave him a hard time when he left his napkin folded in his lap as opposed to spreading it out. (I'm not sure that's a thing, but Clare had an opinion about it.) I hid my smile as he accepted her napkin spreading with a smile. "I can't believe he wore those pants," Clare said. "I made him get new ones last week and told him to put those away." "I'm making those disappear!" she said. I laughed harder. I love that girl, and I have a feeling he's starting to also. Good luck to him! My blue polka-dot sweater had gone through the wash since the salmon oil debacle. Just as I debated a couple of weeks ago about what to wear, I debated again this morning. Connecticut weather has been tricky. We are all ready to pull out our spring clothes, but the outdoor thermostat has different ideas. Whether we like it or not, boots and tights still feel better than capris and flats. In any case, the blue polka-dots seemed like a good choice. "Cute sweater," a co-worker said as I walked into work. Yes, I thought. An oldie but goodie. It was even an easy sweater to wash and seemed no worse for the wear after a good cleaning to get rid of the salmon oil I'd splattered on it. But then I sat down at my desk to dig into a curriculum project I needed to get done. I pulled up the collar to my nose. Triple no. It was 8:45. Could I make it home before my meeting at 10:30? I could, but I wouldn't get the project done. Why didn't I do it the night before? I don't usually save things until the last minute. I tried to concentrate. The smell started to give me a headache. By 9:15, I reached for the motrin. Would motrin help a smell-induced headache. At 9:50, I made a decision. My meeting was a drive away, and if I was quick, I could go a round about way and swing into the Gap just as it opened. There would for sure be a sweater that would match a neutral pair of pants. I didn't have time to make it home, but I did have time to be in and out of the Gap in under five minutes with a beige cotton sweater that looked fine, was on sale, and smelled great. Now what to do with that polka-dot sweater? Today is the final day of the Slice of Life Story Challenge. this event with the team at Two Writing Teachers. With my computer at 11% this morning and the clock at 8:30, I was debating whether to stay with my post that wasn't going so well or get on my yoga gear and head to the 9:00 class. Garth came in to check on my plans. "You coming?" he asked. I took a breath. The words weren't making great sense between my fingertips and the screen. I had thought I'd wake up this morning with some kind of brilliant closing statement about Day 31, but so far I was a muddling mess. "Give me five," I said. As I settled into the mat, I listened to Amy welcome us and talk about one of the hardest things being just getting there. Yep. I'd definitely needed a prod. By the time I finished class this morning, I felt great-- strong, stretched, and present. And I was ready to write my final post of the 2019 SOLSC with the same sort of reflection. Starting was hard, the routine felt great, I have appreciated and valued every comment and connection, and I'm so proud of all of us for deciding to do it and pushing through every day-- or almost every day-- of writing for a month. I'm not ready to write about the slice of yesterday's life that inspired me to write this... I'm still working on the ending and hoping that sticky (expletive) egg gets put together again. Whenever one of my girls struggled to apologize (especially one of them), I'd give them a copy of Randy Pausch's The Last Lecture and have them read the chapter about giving a good apology. There are three parts: saying sorry, owning your part, and then trying to make it better. I've done the first two. I'm working on the third! I walk into the house and instantly notice the smell of lily. I haven't smelled it in the house for a long time. Clare is allergic which is one reason to stop buying them. She's away now. Garth has a tendency to brush up against them, especially when he's wearing a white shirt. Another reason not to buy them. This lily is wisely positioned away from the line of walking traffic. Most of all, they were my dad's thing which may be the true reason I haven't brought myself to buy lilies. "Where'd the lily come from?" I ask my mom. "Bruce brought them to me," she says. Bruce is her financial planner. He does stuff like that. "He had to drop something else off, and he said he was at the garden center buying lilies for his wife, and he thought he'd buy some for me too. Wasn't that nice?" It was. And it also brought floodgates of memories. For Dad, springtime meant trips to the farmer's market before the sun came up, especially when the stands were full of hyacinths, daffodils, and lilies. If he could, he'd talk one of us into going with him. Then the trip would include a stop for coffee and a visit to the donut stand. Even for someone like me who doesn't like donuts, warm ones are tough to resist. Dad liked the coffee cake better than the donuts-- the one with the thick streusel on the top. Those coffee cakes... he could also buy them at the local bakery, and when he was dieting he'd allocate himself a quarter a day. He savored his perfect squares of cake and then found an excuse to make a return visit to the bakery. If anyone wanted a square, he'd share, but mostly we didn't. They were too sweet for everyone except Dad. I'm working hard at keeping my focus because I've already strayed from the moonlit visits to the farmers' markets and into some of my father's habits. I want to keep writing and remembering him... his running, wine-making, guitar learning, fly-fishing, book writing, bread baking, German speaking, scotch drinking-- and his commitment to being a great doctor. I'll rein myself in, and I'll return to the lilies. At this time of year, he'd show up at our homes with pots of fragrant lilies. If we weren't home, we knew he'd been there. I wish he'd been here. Mom. A text from Larkin came across my phone. Who is this? What is this? She sent over a screen shot that someone had sent to her. Are you Melanie Cavo that served as Cornell's lacrosse manager in the spring of 1987? Larkin wanted to know how to respond. The response seemed obvious to me. She could let whoever this person know that she was Melanie Cavo's daughter. She did, and she also asked who it was. We were both wondering for sure. Sorry to contact you out of the blue... the next message started. An old friend Charlie turned out to be the sender of the text, and I spent the day trying to decide how to respond to the rest of his text-- it was just so sad. I haven't been good at keeping in touch with my college friends, especially the lacrosse guys. Being the manager of the men's lacrosse team had some really special moments-- we played in the national championships twice during that time. That being said, the men had a special bond which didn't really transfer to the two women keeping stats. That's pretty easy to understand. So back to the text: One of the nicest guys on the team, a player who graduated two years ahead of me, had died at the beginning of the month. I googled his obituary. Fifty-three. Cancer. I read what I could find about him. He was a dad, a husband, a successful businessman. He still worked out all the time. Loved to bike. And now his friend Charlie had to track down every person associated with the 1987 lacrosse team because he left us all gift cards, and Charlie needs addresses. He left us all gift cards. How he ended up in touch with my daughter is a little beyond me. I had some text exchanges with Charlie tonight, catching up a little bit, mostly offering condolences. They'd been friends for almost forty years. I just sent Richie and Dave messages, as well as Naomi. Your reaching out inspired me. Thanks for that. Thanks to Tim, too.